Welcome to connie-britton.com you’re newest fansite dedicated to amazing actress Connie Britton (Tami Taylor, FNL. 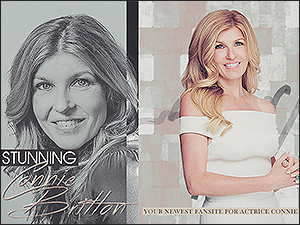 Rayna Jaymes, Nashville) the site is currently a work in progress I have plenty of pictures to add still (thanks to Becca who used to run the amazing Connie Britton Web) and I also plan to add lots of content to the site. Thank you for visiting and please follow us on twitter @StunningBritton. Posted on January 6, 2018 January 6, 2018 Written by Chanel No Comments on Welcome To Stunning Connie Britton!